Cat Beards: Cat Required, Facial Hair Optional | OhGizmo! Caffeinated Granulated Sugar: Why Should Only Your Coffee Have A Kick? By Hazel Chua on 05/24/13 • Leave a comment! Cat Beards are a thing now. Images of cat owners positioning their felines strategically to make it look like they had a beard have gone viral over the past few days and the trend is still going strong. 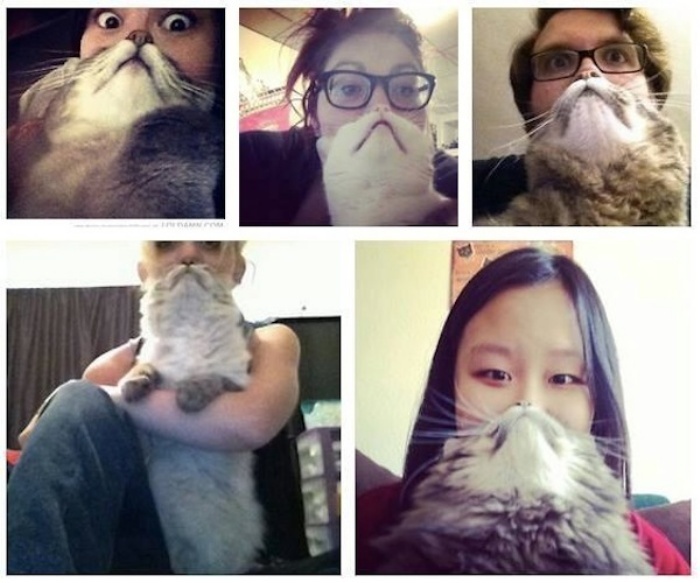 Cat Bearding had its humble beginnings around a year ago when one cat owner decided to take a picture with his pet looking like his beard on catasters Tumblr. The rest, as they say, is history–until the next best or funniest viral thing comes along. You can hit the break for a clip featuring the best of the best cat beards posted on the interwebs so far. Enjoy and have a cat-tastic weekend!